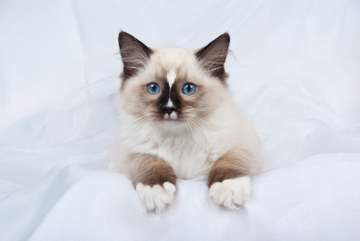 The Ragdoll cat breed - what are Ragdoll cats? Here we take a look at the Ragdoll cat breed, investigating its history, health and looks. There's information, too, about the three different kinds of Ragdoll cats (Mitted, Bicolor and Colorpoint) that make up the breed, which are all shown below in the Ragdoll cat pictures on this page. The Ragdoll cat breed name comes from the way cats of this breed have of collapsing in their owner's arms when they're picked up. All floppy, just like a rag doll! First heard of in 1965, there's a lot of mythology surrounding Ragdoll cats, as well as a certain amount of controversy. So just where did all this intrigue come from? It's said that the 'mother of the breed' was a long-haired white cat called Josephine, who was injured in a car accident and received a fractured pelvis. Josephine (probably as a result of an accidental mating, which according to some sources may have been with a Burmese, Birman, or both) subsequently gave birth to a litter of three kittens, all possessing this 'floppy' characteristic. The rest, as they say, is history – or perhaps mythology! It's claimed that the kittens' 'floppiness' is a result of their mother's injury, but this would be genetically unlikely. It's more probable that this, as well as some of the Ragdoll breed's other characteristics (their placid and docile nature and lack of survival instinct) were received through selective breeding from cats who already possessed these traits. One of Josephine's kittens was mated to a Birman-like cat (with the splendid name of Daddy Warbucks!) who became the Ragdoll founding father. Modern Ragdolls look quite similar to Birmans, or perhaps Himalayans. They're large, stocky, healthy cats, with the males typically weighing between 15-20lb, females slightly less. They have thick coats which are easy to care for as their fur does not mat. As with all long-haired cats, regular brushing and combing is necessary to keep the coats in good condition. Because of their non-aggressive and placid nature, Ragdoll cats should be kept indoors or in a safe enclosure; they're not good at defending themselves. All Ragdolls have large blue eyes, medium-size rounded ears, a long bushy tail, and large round paws, which have tufts of fur between the toes. 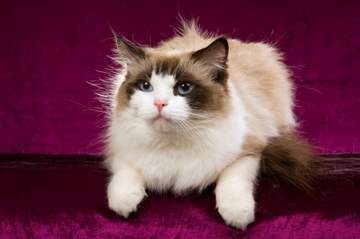 There are three variations of the Ragdoll cat breed. All are found in the seal, chocolate, blue and lilac point colors. The kittens are born completely white and it can take up to three years before their true colors are known. Many Ragdoll cat breeders consider that the Mitted variety (seen in the first Ragdoll cat photo above) is the only true version of the breed. These cats have white chins, bibs and chests with a stripe running all the way from the bib along the stomach to the tail. Mitted Ragdolls are also allowed a narrow stripe on the nose. Their name comes from the white 'mittens' that should be seen on the front paws; the back legs have longer 'boots'. The Bicolor is similar to the Mitted, except that in the Bicolor the legs, chest and stomach are all white. There should be no white markings on the ears or tail. It does, however, have a white inverted 'V' extending down between the eyes over the nose, muzzle and chin. The Colorpoint Ragdoll, as its name suggests, has a pale body with points (ears, face, paws and tail) in one of the four main point colors. The Colorpoint does not have the white facial markings of the other varieties and in fact there should be no white markings at all on the points. 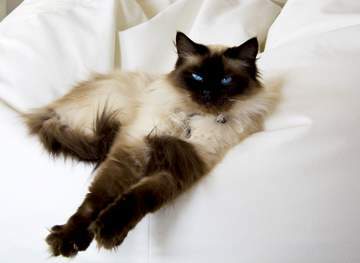 The Colorpoint looks very like a cross between a Siamese and a Persian, which is perhaps why the Ragdoll cat breed is sometimes mistaken for a long-haired Siamese. Seal Colorpoint - no white on points. See the tufted paws!